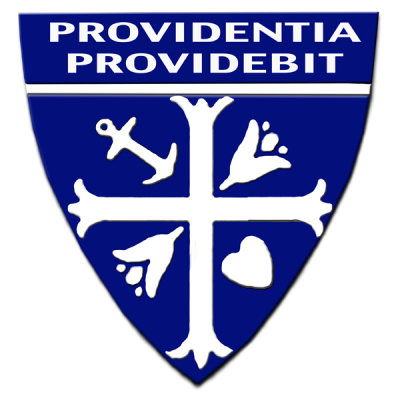 A white cross divides the blue shield into four parts: In the two upper spaces are an anchor and a lily. In the two lower spaces are a lily and heart. The cross represents humility, our distinctive spirit; the anchor, the confidence and trust we have in Almighty God; the heart, the love which we give to all children to whose training we have dedicated ourselves as religious. The lilies represent the purity of our hearts and intentions. Likewise, the lilies symbolize the complete oblation of ourselves and our dependence upon God's Providence, recalled by words of our Blessed Lord: "Consider the lilies of the field: they labor not, neither do they spin, yet I say to you that not even Solomon in all his glory was arrayed as one of these!"